I am much appreciative of help given by Betty Wing whose family has extensively researched the history of the whole Pye family from their origins in Finland and Norway. 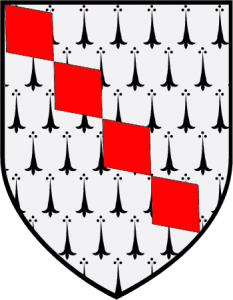 Research shows that most Pyes are descended from, or named from, the family started by Hugh fitz William, Fitz Norman de LaMare, who is mentioned in the Breton Charter dated 1030. The genealogy of Hugh is somewhat of a puzzle. It was after their Kilpeck days that the name Pye came about. William fitz Norman was son or grandson of the Viking forebear Fitz Thorir Thobard, and was granted the fiefdom of Maera in Normandy. He is recorded as being alive in 1114. He served under William the Conqueror and consequently was given extensive holdings in Herefordshire, Gloucestershire and Worcestershire, including the castle of Kilpeck. He became Baron of Kilpeck in Archinfild(sic) and built Kilpeck Castle and Kilpeck Church (Was this a previous one to the current one?). Hugh was born in 1076, probably not a son/grandson of William I as has previously been thought, but related somewhere back in time (See note below). Legend has it that Hugh, when on crusade (1095/1099), was captured by the Saracen Chieftain, the Emir Mohammed (Amiraud). He had a child by the Emir’s daughter, and by her had a daughter who arranged his escape. On his return to England he married Meirig, a Welsh princess, the daughter of King Griffin ap Meredith ap Cynvyn of Archinfild, receiving Saddlebow as his dower (King Griffin is mentioned in the Herefordshire Domesday, dying in 1128. King Meredith had owned the Kilpeck (Chipeete) area before the conquest). In thanks for his deliverance Hugh built, or perhaps rebuilt, Kilpeck church, and in 1134 gave it as a thanksgiving to the Monastery of St Peter at Gloucester (This date is well substantiated). He had three sons, Thomas, Henry and John. Note: Bette Wing, genealogist for the Pye families, has done much research into this part of “the story.” She reckons that William I’s progeny have been extensively researched and the de Kilpecks were not amongst royal children, and it appears William did not have illegitimate children. She is willing to bet that there was a common ancestor in Normandy, though no proof of this – as yet! In 1800’s it became highly popular to have royal descent in your family; some manufactured their own and others paid “genealogists” to create one for them.